The easy-drinking, sharp, bitter bite of a Kolsch-style ale, whether from an American craft brewer or from the traditional Kolsch breweries in Germany, is hard to beat when the sun is shining, or any time you need something a little more on the refreshing side. 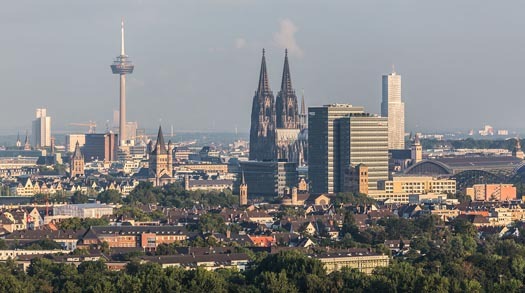 Kolsch is a brewing appellation protected by the 1948 Kölsch Konvention, and is restricted to the 20 or so breweries in and around Cologne, Germany. Cologne, Germany. Photo by Eckhard Henkel via Wikimedia Commons. This distinction is similar to “Champagne,” which must be made from wine grapes grown in the Champagne appellation of France. It is for this reason that our beer is described as a “Kolsch-style ale,” honoring and respecting the name and origin of the style. As a brewery churning out brews since 1896, that’s certainly something we can appreciate. Kolsch is traditionally served in a tall, narrow 200 ml glass called a “Stange” (left), but you’re likely to receive your pour in a standard pint glass at your local tavern. 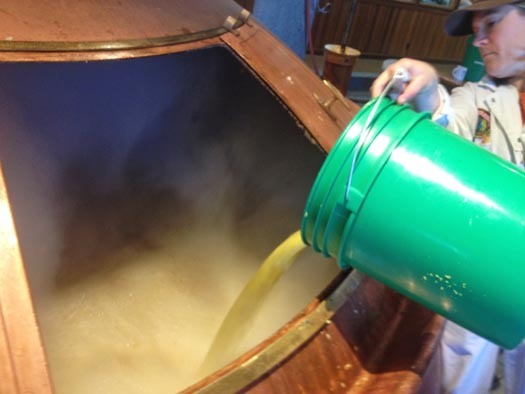 The more craft-focused establishments will serve Kolsch in a Stange, which helps with clarity, aroma and presentation. 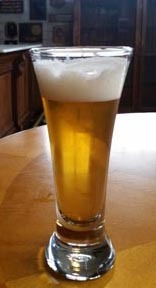 When enjoying a Kolsch, you’ll note a soft, rounded mouthfeel that enhances a delicate flavor balance between the malt, an almost fruity sweetness from fermentation, and a medium-low to medium bitterness with a delicate dryness and slight pucker in the finish. It’s smooth and crisp and is overall a clean, delicately balanced beer. 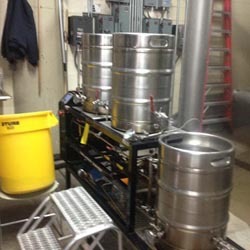 When we began exploring the idea of making a beer specifically for World of Beer (a chain of beer-centric taverns with locations across the US, mainly on the east coast) we used our pilot system to test out a number of possibilities. We tested a tea-infused brew, a fruit-based recipe, and another with a fruit compliment, among others. Knowing this offering will be served on draught during the warmer summer months, we wanted the style and flavor profile to be appropriate for the weather and timeframe. Something easy to drink. A clean, refreshing brew with a low ABV so WOB guests can enjoy more than one. Meyer lemon was a consistent theme in our discussions, so naturally the next step was to do a test brew. After a couple of test batches (and tasting of course, for… scientific purposes) we came to the conclusion that this beer was just way too good to serve it only at the 65+ World of Beer locations throughout the U.S. While WOB will be the first, exclusive owners of our Meyer Lemon Kolsch-style ale beginning this month, we plan to find a home for it in the Anchor family so you can get your hands on it everywhere we distribute across the U.S.
Our Kolsch-style ale is 5.3% ABV and 30 IBUs. 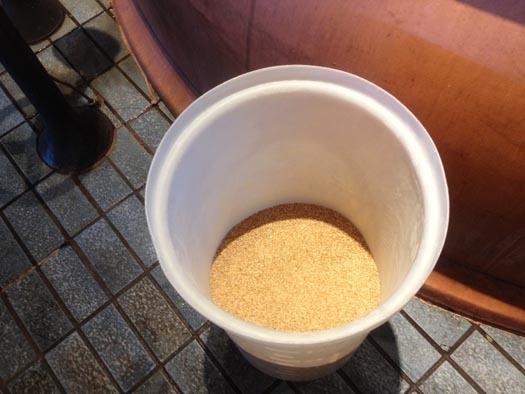 We use pale, pilsner, and white wheat malt, cluster hops, and S.S. Steiner Experimental Hop #7270. The Meyer lemon finds its way into the beer using lemon juice concentrate, lemon granules from dried lemon peel, and the coolest part, hand-squeezed, fresh, lemon juice from local Meyer lemons that folks around the brewery brought in from their own backyards. 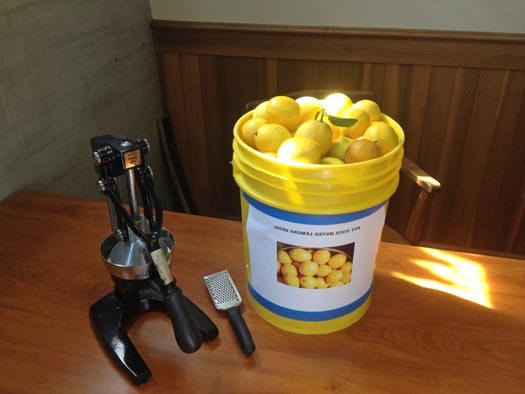 Fresh Meyer lemons with the juicer and zester. 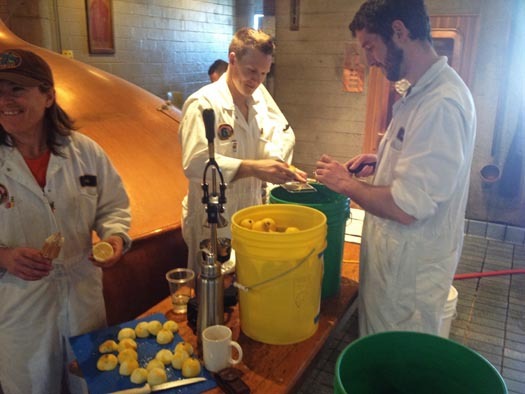 The Meyer lemons are juiced and zested by hand in the brewhouse. The lemon peel granules are separated for adding later. Finally, the lemon peel granules are added to the boil in the brewkettle. It’s an extremely delicious beer, sunshine or not. We hope you’ll find your way into a World of Beer location near you to give it a try. California Uncommon will be available exclusively at WOB from June until about mid-July. If you do have an opportunity to enjoy a pint or two, we’d love to see a photo! Tag your photo with @AnchorBrewing on Instagram or Twitter, or share it on our Facebook page. Staying with the German theme, we bid you Prost!